Archaeologists have called off a hunt for World War II Spitfires in Burma. Originally it was thought as many as 124 Spitfires were buried by the RAF at the end of the war but they have now concluded it was a myth. 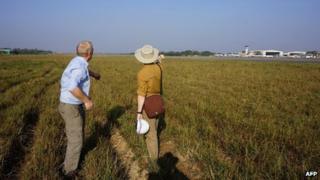 A dig at the international airport near the city of Rangoon, which used to be RAF Mingaladon, has drawn a blank. The project was financed by Wargaming Ltd, who have said they believe the story about Spitfires being delivered in crates and then buried was not true. Tracy Spaight, Wargaming's director of special projects, said: "No-one would have been more delighted than our team had we found Spitfires. "We knew the risks going in, as our team had spent many weeks in the archives and had not found any evidence to support the claim of buried Spitfires." Wargaming Ltd said they now believe no Spitfires were delivered in crates and buried at RAF Mingaladon during 1945 and 1946. The company said that archival records showed that the RAF unit that handled shipments through Rangoon docks only received 37 aircraft in total from three transport ships between 1945 and 1946. Most of the Spitfires that were in Burma at the time appear to have been re-exported in the autumn of 1946, they said. Last month project leader David Cundall, of North Lincolnshire, said he believed they would find the Spitfires but were just digging in the wrong place and said he would apologise if he was proved wrong. Mr Cundall has spent the last 17 years trying to discover the truth of claims that unused, unassembled Spitfires were packed into crates and buried by the RAF at sites in Burma on the orders of Lord Mountbatten at the end of the war in 1945. He collected eyewitness accounts from American and British service personnel as well as local people. One of them, British veteran Stanley Coombe, travelled to Burma to witness the excavation. The dig got the go ahead after it secured funding from Belarussian video games firm Wargaming.net, and received permission from Burmese President Thein Sein during a meeting with British Prime Minister David Cameron last year. Before the dig, scientists had discovered large concentrations of metal under the ground around Rangoon's airport, lending support to the theory that up to 36 planes were buried there. Last month a crate was discovered in the Kachin state capital Myitkyina, but muddy water stopped an immediate identification of its contents. The central city of Meiktila was another site identified as a possible location for the buried Spitfires.